Marian Clarke won election to the U.S. House of Representatives less than two months after the death of her husband, Representative John D. Clarke, in an automobile crash. Shortly after being sworn into office, Congresswoman Clarke confided to the Washington Post: “I wanted dreadfully to come, of course. I felt the need of some absorbing work.”1 While coping with her own loss, Clarke attended to the needs of individuals and industry in her local district struggling with the effects of the Great Depression. On November 5, 1933, while returning home from a wedding along snowy back roads, John Clarke died in a head–on auto wreck. Less than a month after her husband’s death, Marian Clarke was selected at a meeting of district Republican leaders in Sidney, New York, as the GOP nominee to fill out John Clarke’s vacant term.8 It is not clear whether she sought the nomination actively or whether GOP leaders simply offered it to her. She was a compromise candidate, however, chosen on the 11th ballot.9 The heavily Republican New York district encompassed a largely agricultural swath of the state and the city of Binghamton near the border with Pennsylvania. Despite the high number of registered GOP voters residing in the district, New York Democrats felt optimistic about the odds of their candidate, John J. Burns, a retired shoe manufacturer and Binghamton city councilman. Burns boasted strong support among businessmen and expected to benefit from a low rural voter turnout in the dead of winter.10 On December 28, 1933, in a blizzard, constituents— many of them driving to polling places on treacherous roads from their farms—comfortably elected Marian Clarke. Turnout was low, less than 20 percent, but Clarke ran slightly ahead across the entire district and received a large plurality in her Delaware County precincts. With that boost she beat Burns by about 5,000 votes out of approximately 30,000 cast, giving her roughly 60 percent of the total.11 “It has been a life–saver,” she said of the election. “It means that I can go right on with the same interests.12” Clarke became one of just three Republican women—Edith Nourse Rogers of Massachusetts and Florence Kahn of California were the others—elected to Congress during the first six years of the New Deal. She also held the distinction of being the only woman among the 45 members of the New York congressional delegation. 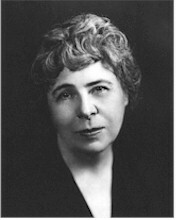 When Clarke took her seat in the House on January 3, 1934, she received assignments on three minor committees: Civil Service, Claims, and Invalid Pensions.13 In her first floor speech, Representative Clarke introduced a measure to raise the equipment allowance for rural mail carriers to cover winter and early spring months. In a district with many dirt roads, Clarke insisted such an extension would greatly aid postal carriers forced to navigate icy roads on snowmobiles or muddy springtime lanes by car. Increased allowances also would help offset increased insurance expenses and a new four–cent gas tax. “No one is more aware than I of the necessity for economy at the present time, but it seems to me as though there might be other ways to save this amount that would be more humanitarian than taking it from these men whose lives are already so hard,” Clarke said to applause from the floor and gallery.14 Despite passing the House, the bill languished in committee in the Senate.15 In March 1934, Clarke introduced a bill to reimburse Army personnel for personal property losses incurred during the infamous 1915 hurricane which struck Texas’s Gulf Coast.16 Having lived for more than a decade in the capital, Clarke also played an active role in several Washington, D.C., women’s organizations. During her short stint as a Representative, Clarke exhibited limited legislative effectiveness due to her relative political inexperience and because Democrats greatly outnumbered Republicans in the House. In 1934, she declined to run for the GOP renomination. The eventual Republican nominee, Bert Lord, a lumber businessman from Afton, New York, and former state commissioner of motor vehicles, won handily that fall. Upon her retirement from the House, Clarke returned to Arbor Hill. She remained active in GOP politics and served as an alternate to the 1936 Republican National Convention in Cleveland. Tragedy struck Marian Clarke again when her only son died in an auto wreck in 1939. She lived most of the remainder of her life in relative seclusion at Arbor Hill. Clarke died in Cooperstown, New York, on April 8, 1953. 1“Congresswoman Clarke Finds Pleasure in Legislative Job,” 20 January 1934, Washington Post: 11. 2Marian K. Williams’s father’s name is nearly illegible in the 1900 Federal Census. In 2010, a descendent of Congresswoman Williams indicated that his name was "Rhys Williams." 4“J.D. Clarke Killed in a Motor Crash,” 6 November 1933, New York Times: 16. 5David J. Weber, with a foreword by Senator Gaylord A. Nelson, Outstanding Environmentalists of Congress (Washington, D.C.: U.S. Capitol Historical Society, 2002): 48—49. 7Susan Tolchin, Women in Congress (Washington, D.C.: Government Printing Office, 1976): 17; Hope Chamberlin, A Minority of Members: Women in the U.S. Congress (New York: Praeger, 1973): 103. 8“Nominated for Congress,” 7 December 1933, New York Times: 15. 9“Democrats Predict Up–State Victory,” 17 December 1933, New York Times: N1. 11“Mrs. Clarke Wins Seat in Congress,” 29 December 1933, New York Times: 2. 12Tolchin, Women in Congress: 17. 13Charles Stewart III, “Committee Hierarchies in the Modernizing House, 1875–1947,” American Journal of Political Science 36 (1992): 845–846. The paper includes rankings of House committees before the Legislative Reorganization Act of 1946 and makes a connection between committee transfers and the relative attractiveness of committee assignments; Karen Foerstel, Biographical Dictionary of Congressional Women (Westport, CT: Greenwood Press, 1999): 59. 14Congressional Record, House, 73rd Cong., 2nd sess. (26 January 1934): 1421–1422. 15Congressional Record, House, 73rd Cong., 2nd sess. (21 May 1934): 9196–9197. 16Congressional Record, House, 73rd Cong., 2nd sess. (1 June 1934): 10275. 17Tolchin, Women in Congress: 17; Chamberlin, A Minority of Members: 103. Papers: In the John Davenport Clarke Papers, 1921-1933, approximately 2,000 items. Also contains the congressional papers of Marian Clarke, who completed her husband's term in Congress. "Marian Williams Clarke" in Women in Congress, 1917-2006. Prepared under the direction of the Committee on House Administration by the Office of History & Preservation, U.S. House of Representatives. Washington: Government Printing Office, 2006.